Elmar Kits has been called Estonia’s Picasso since his creative range was very abundant and broad. His body of creative work includes impressionist, postimpressionist, realistic, semiabstract and abstract works. In addition to oil paintings, Kits has also created several important monumental paintings. Kits became a notable artist at the end of the 1930’s already immediately after completing school at Pallas. He also was subjected to attacks in the 1940’s from the Soviet regime that occupied Estonia when he was accused of formalism, in other words paying more attention to questions of form in a work of art instead of focusing on thematic questions. Thereafter Kits’s style became more realistic and he also gained official acclaim, especially after his Karelian series of paintings in the mid-1950’s. Kits’s style became much more free in the 1960’s and it started approaching abstract art in the middle of the decade. Exhibitions held in 1966 in Tartu and Tallinn brought dozens of semiabstract works before the public, which also meant an important step in terms of artistic policy since that kind of art was not officially held in favour. Kits continued to work in a similar style to the end of his life. Thirty-year-old Elmar Kits had participated in exhibitions for several years already and made a name for himself by 1943. Many of his works had attracted the attention of both critics and museums. 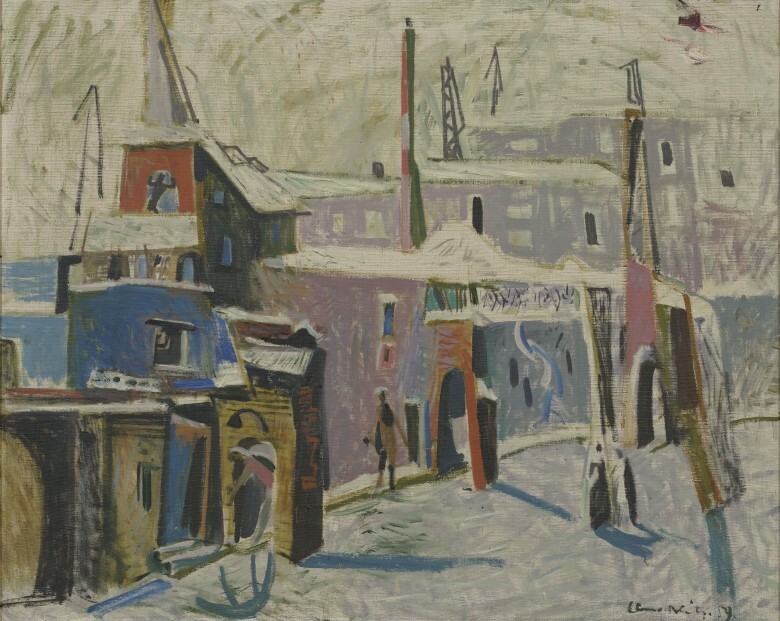 In 1940, he had already taken a job as a teacher at the Pallas School but during the German occupation in 1941-1944, he worked as a freelance artist, participating actively in exhibitions – he was productive during those years, completing over thirty paintings during those three years. The end of the 1930’s until his solo exhibition in 1946 is considered Elmar Kits’s first creative period. “During those years, this artist’s restless creative nature that was always seeking new solutions revealed itself more clearly,” wrote Mare Joonsalu. He was avidly interested in conveying light and shadow as well as atmosphere, yet it was first and foremost his vivid sense of colour that earned him praise. Elmar Kits had a special connection to Valgemetsa. Namely, Kits acquired a summerhouse in Valgemetsa in 1950 – thus eight years after the completion of this painting. The landowner there purposely had his approximately 200 hectare landholding on the banks of the Ahja River parcelled into cottage lots in the 1930’s since the Tartu-Petseri railway line had been completed, thus improving connections with Tartu. His calculation was correct: ordinary citizens started coming here from the city as well as intellectuals, who started spending their summer vacations in Valgemetsa. Among others, the rector of the University of Tartu and several industrialists built summerhouses there, and artists and others also vacationed there. Nearly 60 cottages had quickly sprung up and a guesthouse was also built along with a store and a post office. Even sports fields, tennis courts and a heated swimming pool (!) were planned. 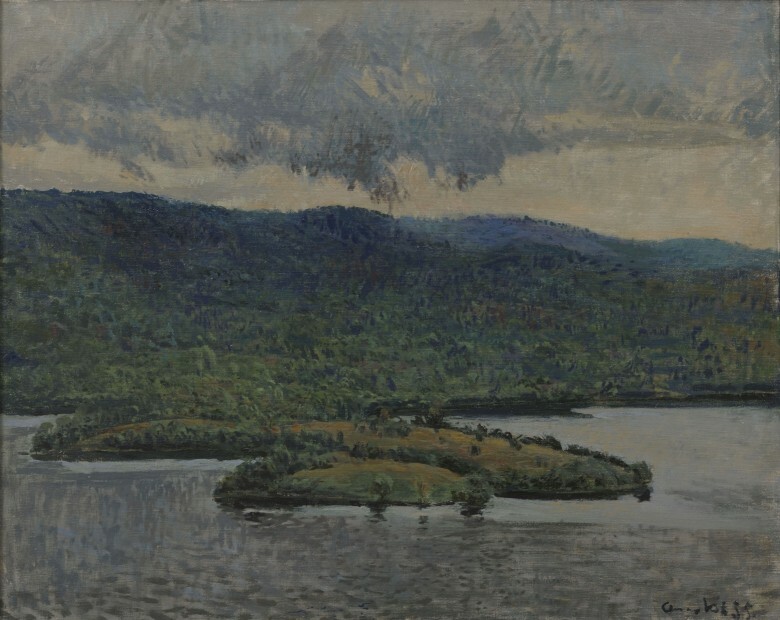 Valgemetsa was doubtless still in its prime as a place for summer vacationing in 1942, when Kits went there to paint, yet as a passionate traveller and fisherman, Kits was nevertheless still interested first and foremost in problems related to painting, for which nature and the problems of light, shadow and colour that arise there offered excellent assignments. 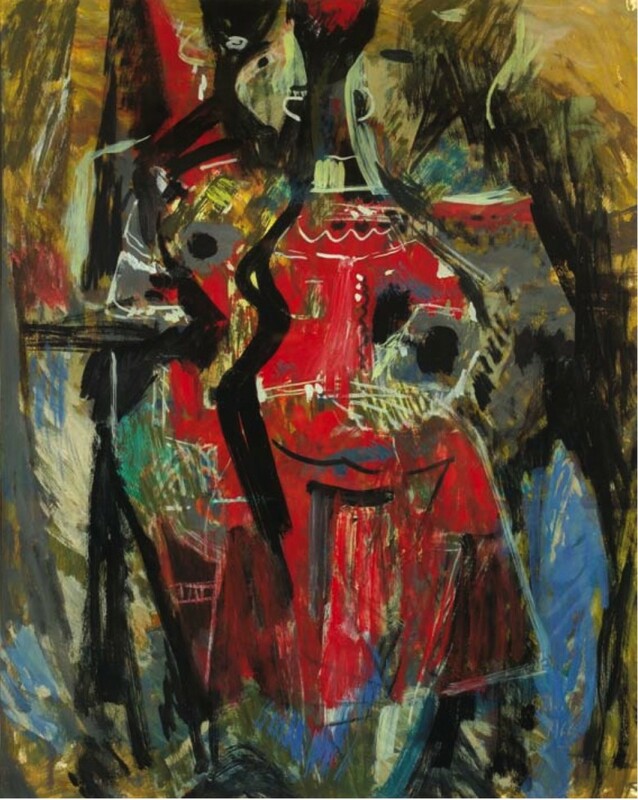 The mid-1940’s until his solo exhibition in 1946 is considered Elmar Kits’s first creative period. “During those years, this artist’s restless creative nature that was always seeking new solutions revealed itself more clearly,” wrote Mare Joonsalu. He was avidly interested in conveying light and shadow as well as atmosphere, yet it was first and foremost his vivid sense of colour that earned him praise. Suislepa motifs form a separate series. At the same time, it is known that Kits painted together with Endel Kõks as a guest of Eduard Rüga at Viira in Tori, Pärnu County in the summer of 1943. Kits lived with his family in Uus-Suislepa in Viljandi County during the German occupation. There several landscape views were completed. “E. Kits paints against the light, typical of the landscape paintings he completed in Suislepa, thus creating a harmonious pictorial whole with the forest looking like a silhouette and brightly lit sky and more colourful strips of field in the alternating rhythm of groups of trees,” wrote Joonsalu and added that this series stands alone as a particular episode in Kits’s body of creative work. 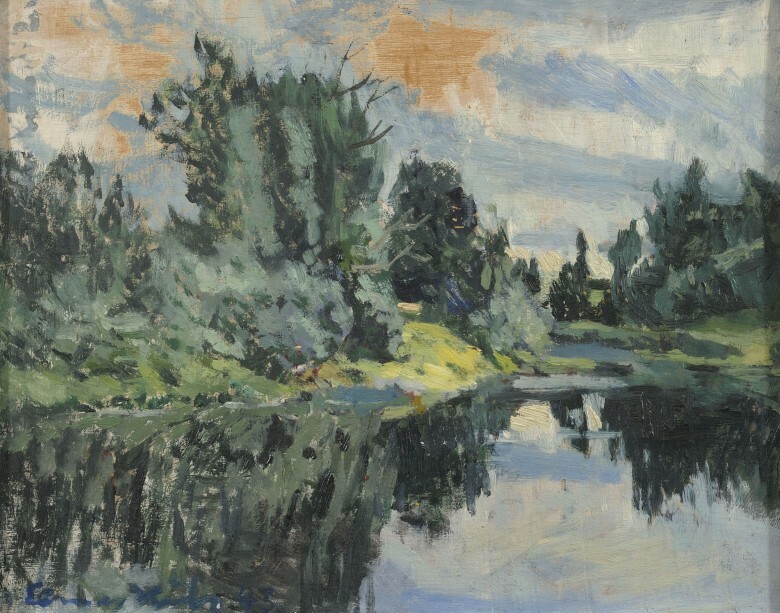 Voldemar Erm added in 1959 that while summertime landscapes are usually considered boring, Kits achieved a new effect by painting against the light. 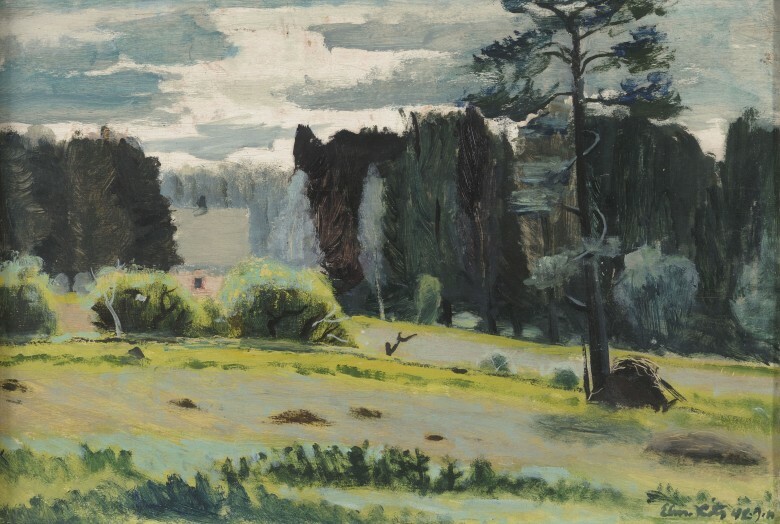 The series of Karelian landscapes consisting of 28 paintings formed the core of Elmar Kits’s exhibition held at the Tartu Art Museum in 1956, which generated a very positive response and after which Kits was among other things ascribed the honorary title of Artist of Merit. Kits was in Karelia together with Richard Sagrits for a relatively short time in September and October of 1955. They started out from Petrosadovski, stopped for a short time in kolkhoz (collective farm) villages on the northern shore of Lake Äänisjärv, then moved onward inland into the area of the Suna River and the regional centre of Spasskaya Guba, and finally they went by ship to the town of Kemi on the shores of the White Sea. "Karelian Forests" is one of the best-known works of the series and has repeatedly been reproduced and mentioned in literature. View of the City apparently depicts Tartu as it plays with forms, displacing them and placing them in new relationships. This is extremely striking compared to the very realistic views of Karelia completed only three years previously. At the same time, Kits chose the politically neutral genre of the urban view for his experiments in form, even though motifs can be seen even here that were most certainly not favoured in the 1950’s – for instance a church tower. Incidentally, it is worthwhile to pay separate attention to the grotesque figure in the church’s bell tower. Who is he? What does the artist want to say? Kits frequently depicted people in different activities. Here his tendency towards lyricism is striking – Kits liked to paint people playing the violin, dancing ballet, making music, painting paintings, etc. At the same time, Kits was not afraid to veer towards the grotesque to show man’s more depraved side, a tendency betrayed by the titles of works such as Conversations between Idiots or Monstrous Face. Kits has depicted figures at a table on other occasions as well, admittedly under different names (for instance, Women at a Table). This can be considered an elaboration of the French-style pallasesque café motif where people seated at a table converse, thereby expressing a certain urban elegance. The mood in Kits’s painting, however, comes across as being altogether gloomier and more distorted, of course. People really are no longer people but merely figures – the outer shells of people. The rhythm of colours here is also considerably more agitated. 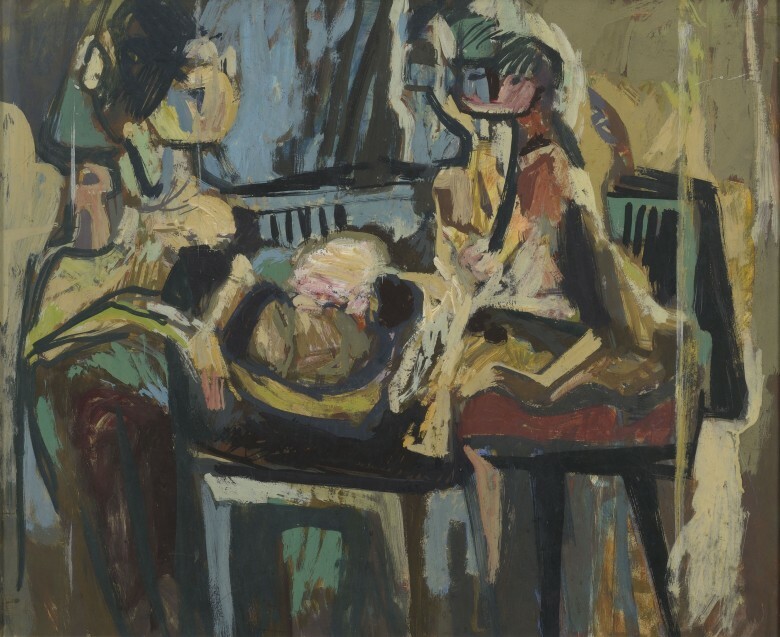 Neither the black contour around the figure on the left nor the bench behind two figures, which should hold the composition together better, can bring order to the colour rhythm. Kits has apparently conveyed the anxieties of the era or his own internal tensions without losing sight of the quality of the work of art for even a moment. Elmar Kits’s solo exhibition was held in the autumn of 1966 at the Tartu Artists’ Building, which was pivotal not only in Kits’s creative work but also in the history of Estonian art as a whole. Here Kits displayed around a hundred mostly semi-abstract paintings that were mostly painted during that very same year of 1966. This work was not displayed at that exhibition, yet it organically belongs together with other analogous works. 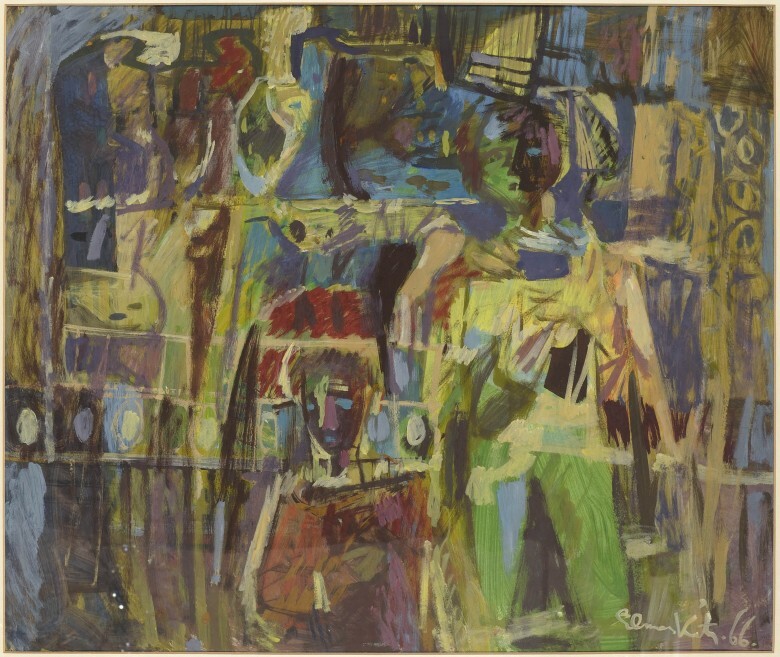 Several works that were on display at the exhibition in 1966 directly addressed relations between man and society, others gravitated towards surrealism, still others dealt purely with form and colour. The organic development of Kits’s semi-abstract paintings from his earlier works is mentioned in reviews, although the differences are rather large. Ilmar Malin notes in one review that there are “people in their endlessly abundant possibilities of states” in Kits’s art but that there is also internal tension and an abundance of viewpoints. 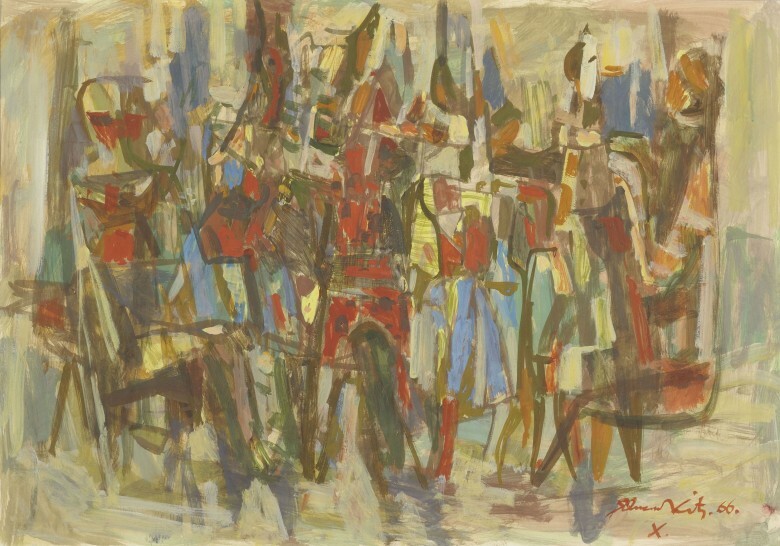 This work participated in Elmar Kits’s legendary solo exhibition at the Tartu Artists’ Building in the autumn of 1966. This exhibition was revolutionary not only in terms of Kits’s creative work but also in the entire history of Estonian art. 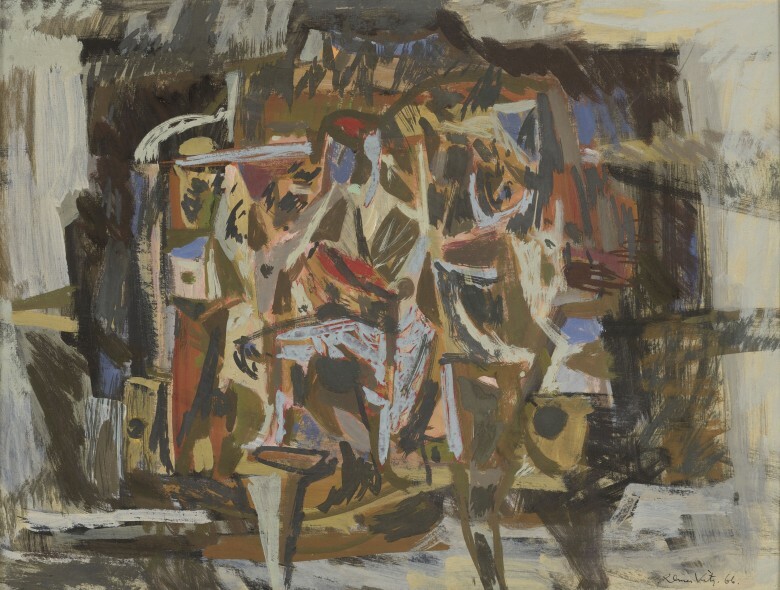 The exhibition is spoken of as being pioneering since it showed to the Soviet artistic world for the first time the possibilities of abstract art, and did so in a very powerful way. Here Kits demonstrated around a hundred mostly semi-abstract paintings, which had mostly been painted during that very same year of 1966. According to Tiiu Talvistu, the exhibition was a turning point primarily for Kits himself since until then he had participated in exhibitions mainly with landscapes and realistic compositions. On the other hand, this was also a “manifestation of modern art and a top-shelf event of the 1960’s”. The year 1966, when this work was completed, was undoubtedly pivotal for Elmar Kits. 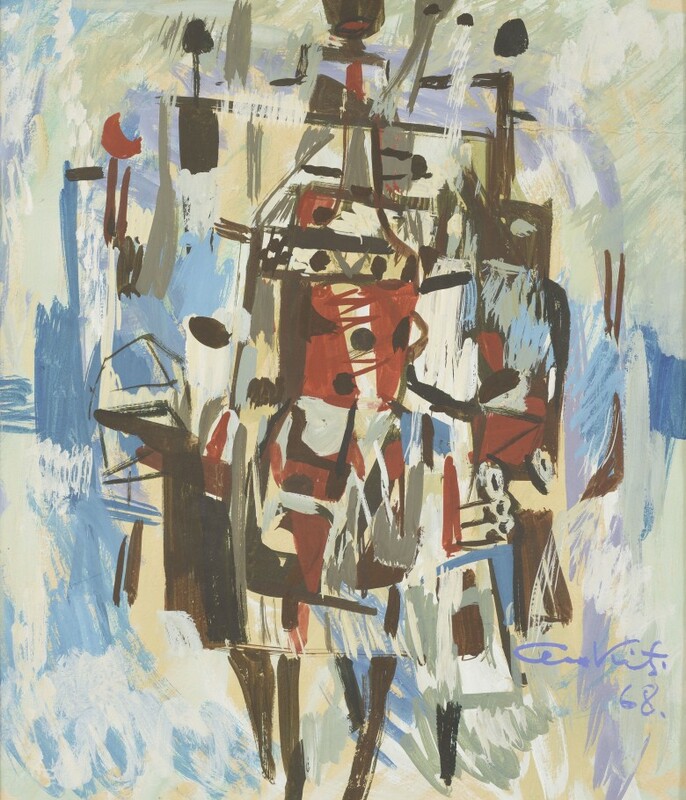 His solo exhibitions in Tallinn and Tartu introduced Kits’s semi-abstract works to the public at large and made the establishment of this kind of approach to art possible. Kits nevertheless did not yet become pervasively and completely abstract in his works. Some types of themes, characters or motifs are noticeable in his works again and again. Grotesque faces and some sort of ambiguous situation emerge from among the colours in this painting as well with its very generalised title. Abstract images are nevertheless of greater importance here: colours and forms, and the relations between them. Elmar Kits’s semi-abstract works are well known. There were many of them and they were not in one style. Many of these works directly addressed relations between man and society, others gravitated towards surrealism, still others dealt purely with the interplay between form and colour. Reviews mention that Kits’s semi-abstract works grew organically out of his earlier creative work, even though the differences are quite significant. Voldemar Erm notices a style of usage that boldly reshapes and subjectively interprets reality, the frequent occurrence of motion motifs, restless usage of form, dynamic brush strokes, yet also restraint in the range of colour and the close connection between the works and contemporary problems (this last remark could have also have been meant as justification of abstract art in the wake of socialist realist canons). Ilmar Malin notes in one review that Kits’s art includes “people with the possibilities of their endlessly abundant conditions” but also inner tension and an abundance of points of view.